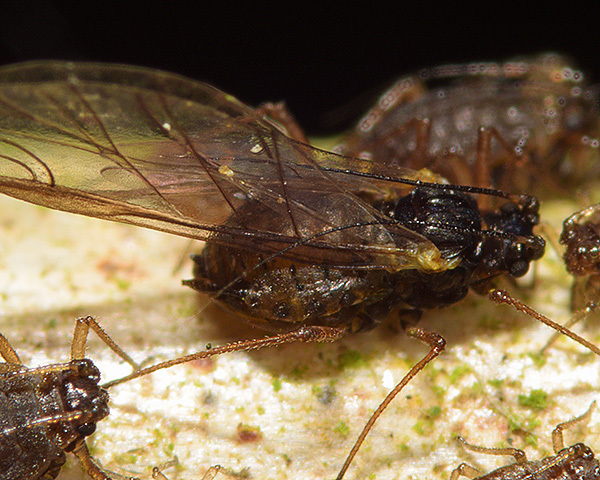 The adult aptera of Rhopalosiphoninus ribesinus is medium-sized dull reddish brown to brownish with the dorsum sclerotized and with a rugose texture. The head is spiculose and the antennae are long and thin. The antennal tubercles are well developed with their inner faces steep-sided or apically convergent. The siphunculi are dark and strongly swollen between the constricted basal and strongly flanged apical parts. The siphunculi are 2.5-3 times the length of the short triangular cauda. 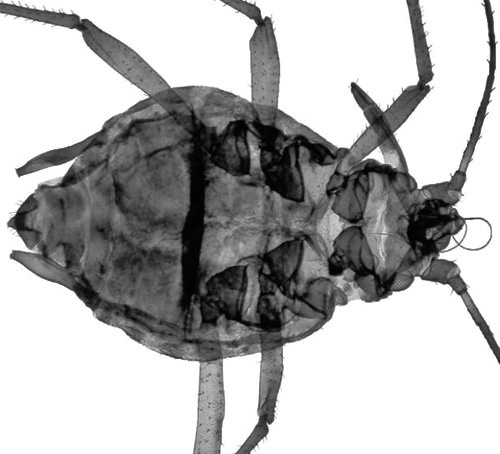 The body length of Rhopalosiphoninus ribesinus apterae is 2.0-2.5 mm. Rhopalosiphoninus ribesinus alatae (see second picture above) are dull reddish brown to brownish black with no black dorsal abdominal patch. The clarified slide mounts below are of adult viviparous female Rhopalosiphoninus ribesinus : wingless, and winged. The currant stem aphid does not host alternate but feeds only on currants (Ribes spp.). It feeds in damp shady places mainly on the old wood of lower shoots of redcurrant, but also on the young shoots and leaves. Rhopalosiphoninus ribesinus is not thought to be of economic importance. It is found in Britain, northern Europe and west Siberia. 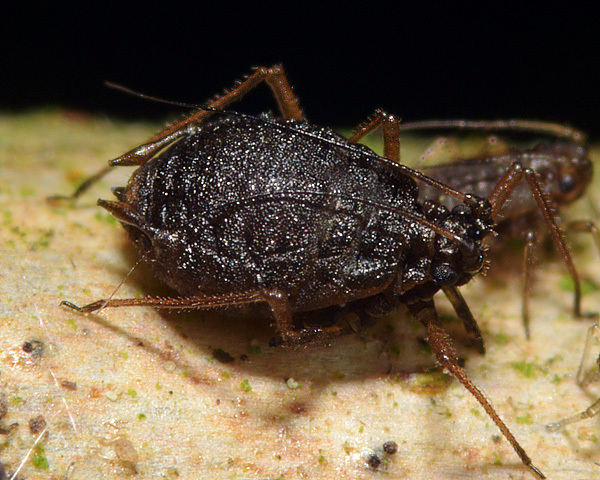 The currant stem aphid is a rare aphid, which is observed even less often than might be expected given its habitat preference. Like most other Rhopalosiphonus species Rhopalosiphoninus ribesinus likes a very humid habitat, which it finds by feeding low down on redcurrant stems, usually just above the ground surface. 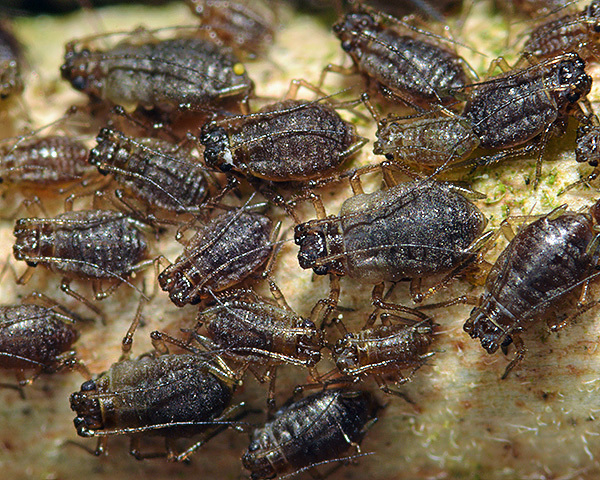 The colony shown above was found in deciduous woodland in May 2012. Most of these developing immatures have wing buds and are therefore destimed to be alatae. They will most likely migrate away from this site to found new colonies. As is usual for Rhopalosiphonus aphids, the colony was not attended by ants. 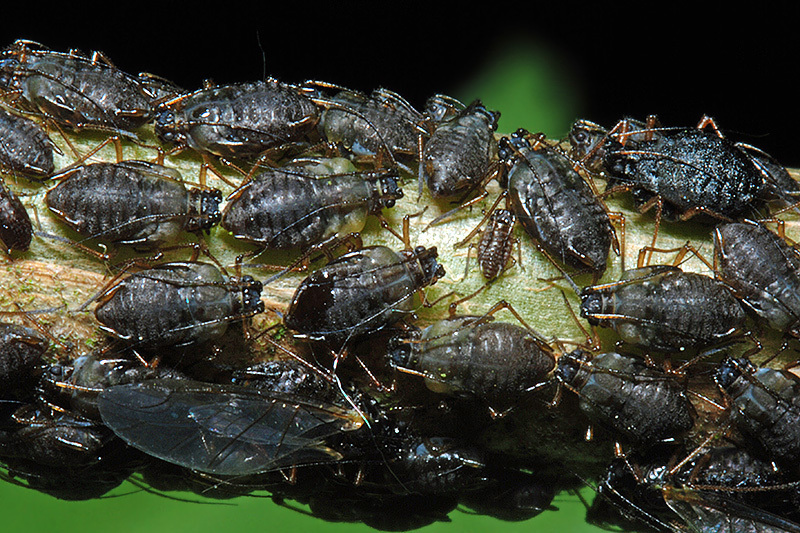 Most of the aphids in the picture above are second and third instar nymphs of Rhopalosiphoninus ribesinus. Rhopalosiphoninus ribesinus has been recorded from 3 Ribes species (Ribes nigrum, Ribes rubrum Ribes spicatum ssp. hispidulum). Blackman & Eastop list 4 species of aphid as feeding on Ribes spicatum ssp. hispidulum worldwide, and provide formal identification keys. 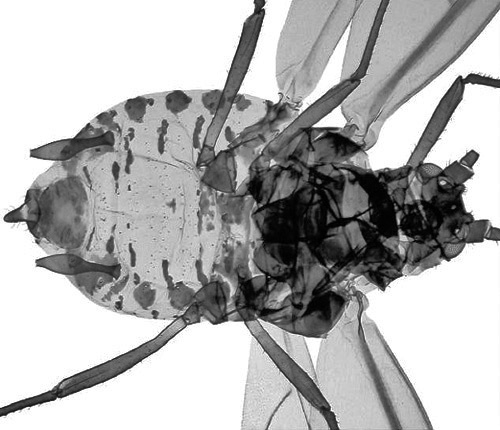 Of those aphid species, Baker (2015) lists all 4 as occurring in Britain: Cryptomyzus ribis, Hyperomyzus lactucae, Hyperomyzus rhinanthi and Rhopalosiphoninus ribesinus.